It’s sad to see the end of basketball city. So many great moments there over the years. I realize that the Hudson River Park Trust has big plans for this plot of land but we’ve got so little space for sports in downtown NYC that every lost square foot costs us dearly. It would make me feel better if the Trust would have mandated that Pier 40 be a sports facility in its RFP. If we get an entertainment complex on Pier 40, we’ll be doubly screwed. The thing that really frosts me about this whole thing is that Bloomberg’s PlanNYC specifically calls out for more outdoor space where we can play sports. The Hudson River Park is awesome, don’t get me wrong. But you can’t play soccer, baseball, and basketball next to the bike path. And the idea of doing that on the roof of an entertainment complex is just silly. 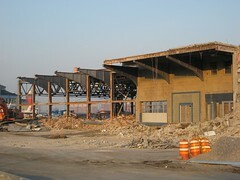 Let’s hope we don’t see a picture like this of Pier 40 anytime soon. That might just kill me.